I actually prefer boxing day, though, y’know. It’s so much more relaxed, and there’s no pressure but there is just as much eating so it’s pretty perfect. My skin has not been too happy lately, so I’m taking a break from the red lips and glitter today, and just going for a skincare pamper. Well, in between eating leftovers. Going to start the day off with an intensive moisturiser, because I need all of the skin TLC. My pick of the moment is the Oskia nutri-active day cream, which is lovely and hydrating. I’m such a fan of the Oskia cleanser, so it was about time I explored more of the brand. Still loving the Sunday Riley Blue moon cleanser, as it leaves skin feeling so soft and nourished. 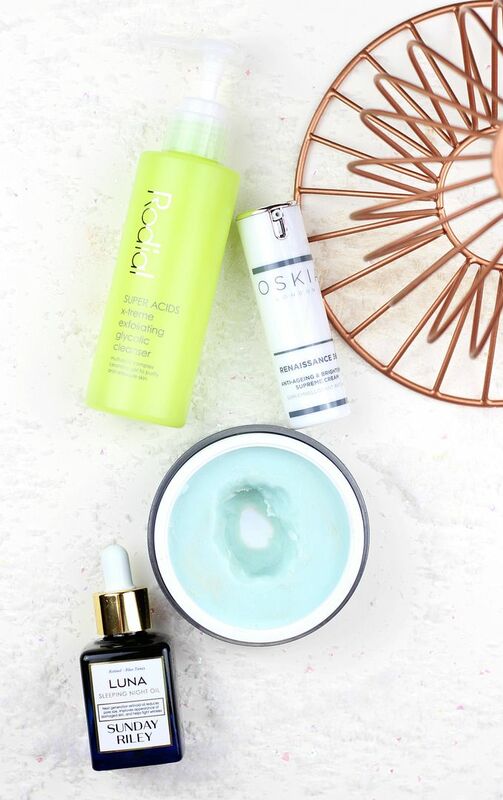 Double cleansing is the way forward for pampered skin, and I’m obsessed with the Rodial super acids x-treme cleanser at the moment. It sounds really scary, but it is just a glycolic acid gel cleanser that has lots of fruit enzymes to make your skin look brighter. It doesn’t hurt or tingle or anything, so don’t be put off by the name. Playing matchy matchy with cleanser, I picked up Sunday Riley Luna oil last week, and have been using it every night to make my skin better (she says optimistically).